Place water and salt in a large stock–‐pot or steam jacketed kettle and bring to a boil. Slowly add lasagna noodles and cook for 10–‐12 minutes until tender. Drain and set aside. Heat the oil in a tilt skillet or stovetop pan large enough to hold the ingredients. Add onion, shredded carrots and spinach and cook until vegetables are heated through and onion is translucent. Drain off any excess liquid. In a steam-jacketed kettle or large stock pan, heat the tomato sauce and tomato paste. Add the oregano and granulated garlic. Simmer, uncovered for 20 minutes. In a large bowl, combine cottage cheese, dried parsley and grated Parmesan cheese. Mix well to combine. Spread 1/4 (roughly 1 quart + 2 cups for 50 servings) of tomato sauce on the bottom of each steam table pan (12”x20”x 2 ½”). For 50 servings, use 2 pans. 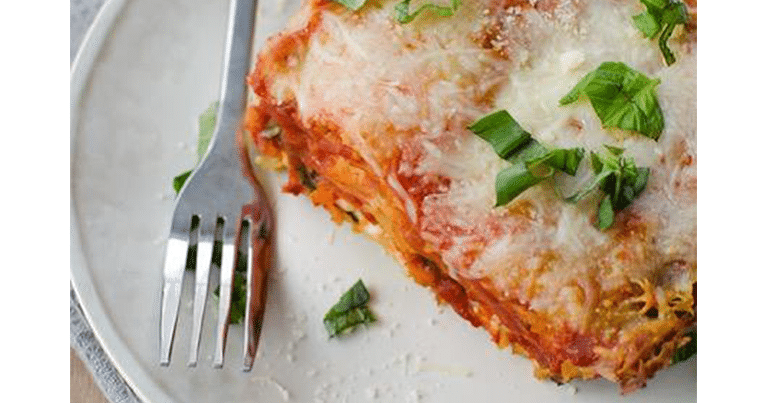 For 100 servings, use 4 pans.Layer with a single layer of noodles, ¼ of the vegetable mixture, ¼ of the cheese mixture, and another layer of tomato sauce. Continue to create three additional layers ending with a single layer of noodles and remainder of sauce. Sprinkle mozzarella cheese over each pan of lasagna and cover with foil. Bake in conventional oven at 375°F for 50 minutes; Convection oven at 350°F for 40 minutes.